Rainbow Cupcakes, add colors to your day! Rainbow cupcakes are pretty additions to any party table, and they’re actually not that difficult to make. 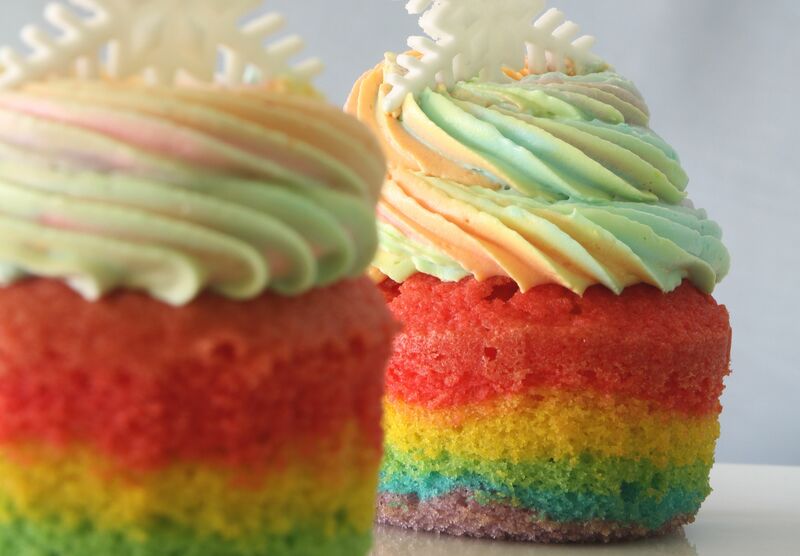 Get started on your own batch of rainbow cupcakes with this delicious recipe. This recipe is courtesy of Cindy Chan of Baker’s Art KL and was first published in Flavours magazine. Preheat oven to 180°C. Sift ground almond, flour and baking powder together and set aside. Cream butter and sugar until light and fluffy. Add eggs and egg yolks one at a time, beating well after each addition. Add the vanilla essence and zest. Fold in the sifted flour mixture, alternating with milk, until well mixed. Divide the batter into 6 portions and colour each portion individually with a rainbow colour. Spoon the coloured mixture into 6 individual piping bags. Pipe 6 different layers of colour into the cupcake cases and bake for 15-18 minutes, until top is golden brown. In a stand mixer, whip egg yolks. In a saucepan, cook water and sugar to 115°C and slowly pour into the whipped egg yolks; whip until cool. Add softened butter to emulsify. Divide the icing into 6 portions and colour each portion individually with a rainbow colour. Spoon the coloured mixture into a piping bag. Pipe a swirl onto the cupcake and decorate as desired.